The Reluctant Fundamentalist is a political drama, directed by Mira Nair, to a screenplay by William Wheeler and Rutvik Oza. It tells the story of a USA alien resident, named Changez from Pakistan. Changez, who was educated at Princeton and later finds work at a lucrative American corporation, loves the USA. He is a smart, ambitious young man, who sees a future for himself in America; that is, until 9/11. After that, everything changes. Searching for Sugar Man is a modern Cinderella story. It is a story of a search, of a journey that changed lives forever, and that is its charm. At the heart of the search is an American named Sixto Rodriguez, a Detroit based unknown musician, whose career in the early 1970s proved to be short lived with two albums that hardly sold in the USA. Unbeknown to him, his music became very successful and much influential in South Africa. Fast forward to the 1990s, when two determined South African fans, Stephen 'Sugar' Segerman and Craig Bartholomew Strydom, manage to track Rodriguez down, a task not made easy given Rodriguez' obscurity. 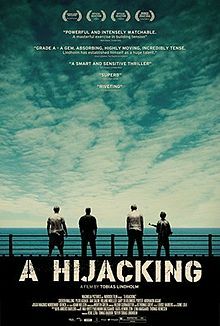 A Hijacking is a psychological thriller portraying the breakdown of both an A type and a B type personalities under challenging circumstances, leaving scars that will never heal. It is a very well-made chilling film, that takes place worlds away from the universe of Captain Jack Sparrow. The review of Rise of the Guardians is utterly different if coming from an adult, or from a child's perspective; if it was a really good film, that should not have been the case, but being its anything but a great movie, it is. If your kids want to see this flick, there is no harm in it. Just get it on DVD and find yourself something else better to do. No covers about a month in 1988, during which Chile, under Pinochet, was subjected to an intense political advertising campaign. What makes No, the film, special, is its unique perspective. It follows a young promising advertising executive who guides the No campaign; a campaign organized by a coalition of the opposition parties. The plot further thrusts this character, René, played by the mesmerizing Mexican actor Gael García Bernal, against various opposing powers, including his own agency's boss, his ex-wife, members of his own campaign and, of course, the Pinochet administration of terror. If you are interested in good intense drama, based on historical events, say Yes to No.